Kyle and Matt Ramsey were lucky to return home alive from The War Between the States – Kyle wore his empty left sleeve as a badge of honor. Crossing the Texas border, the fearless brothers expected a heroes’ welcome. Instead, they found that their fight for freedom had only just begun. Having read a few of the later entries in this eighteen-book series I’ve been keen to go back to the beginning and discover how it all began. The first three entries were written by Gary Clifton Wisler, an author I don’t remember reading anything by before. Three other authors would then write behind the Will McLennan pseudonym, these being, I believe, Ed Gorman, Robert J. Conley and John Legg, the latter writing the lions share. When Matt and Kyle return home I was surprised to discover how young their younger brothers were but as the book progressed it covered a couple of years so I could see how the brothers would grow if each book continued at this pace. Like most of those I’ve read Matt is the center character, a man who hoped to find peace when returning home from the horrors of the Civil War. Yet a combination of carpetbaggers, family tragedy and white hooded riders calling themselves the Knights of the Silver Circle soon wipe away happiness and replace it with bitterness. An anger that can only be satisfied by hitting back but will this be enough to cleanse that resentment? Gary Clifton Wisler has written a very readable book, his study of changing emotions as equally gripping as his action scenes, and some of the latter paint very vivid images in the minds-eye and are extremely hard-hitting. The close of the story promises new adventures for the surviving Ramsey’s and on the strength of this opening tale I’d certainly be wanting to read more. The Old West is uniquely American. It is a legend brought to life in sagas of blazing six-gun justice in wide-open towns and across vast ranges. 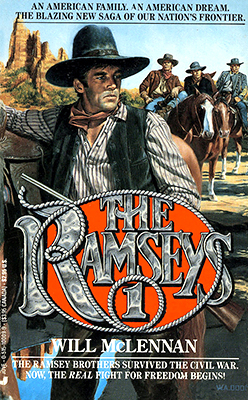 52 Weeks – 52 Western Novels is a fun guide to some of the best of these Western tales. Step into the Old West. Ride dusty trails, slap leather with outlaws, and get ready to battle Indians and the elements – all from the comfort of your favourite reading spot. Scott Harris and Paul Bishop, along with a number of guest contributors, have brought together 52 western books that are favourites of theirs. Among them you’ll find old favourites and hopefully discover some new works to add to your collection. This book is beautifully designed by Kari Kurti and Nerissa Stacey making it a pleasure to browse. Its presentation is well thought out, each entry including clear renditions of covers and film posters, many of which are supported by portraits of the authors too. Every entry is broken down into the same five or six sections depending whether the book in question has been filmed, these being; Book Facts, Author Facts, Beyond the Facts, Fun Fact, Movie Facts and a Favourite Quote. Every now-and-again you’ll come across a double-page spread Celebrating some aspect of the western genre such as the work of Louis L’Amour, the Piccadilly Cowboys and Western Comics. The book closes with profiles of the editors and the guest contributors. 52 Weeks was never intended to be a “Best of” collection, it’s purpose is to bring together some excellent examples of the western, gathered together by fans of the genre. This ensures there is a wide selection that covers all types and eras of these books being written, from 1902 to 2015. This book offers much in the way of information behind the creation of those novels you love to read and will certainly have you searching for those you don’t yet have in your personal library. The book is intended for dipping into at your leisure, but I’m sure many readers will devour it all as soon as you get hold of a copy like I did and I can guarantee you’ll return to it time-and-again to re-read those entries whilst struggling to choose just which of the many great books to be found within its pages you’ll want to hunt for next. 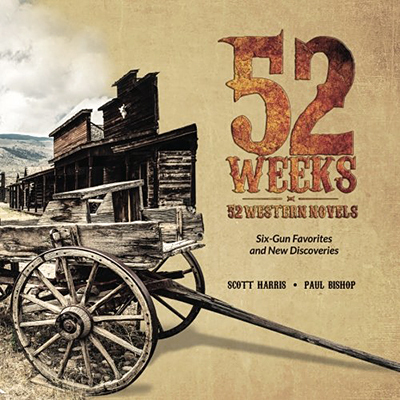 52 Weeks – 52 Western Novels is a reference book every fan of the western genre should own as it’s a sheer pleasure to read and proves to be a valuable resource for discovering new books and authors that you’ll enjoy adding to your must-read list. This book is filled with great characters, Jeeter Frost, Ernestine, the weary lawman Seamus Glickman, and the leading citizens of Coffin Varnish. None of them are overly admirable people but they are definitely fascinating and their interactions and dealings make for a terrific read. The story is fast moving, action packed, and contains many moments of humour. The dying town of Coffin Varnish is wonderfully described and you can feel the despair of those who live there. Greed and dreams of greatness fuel the motives of many of the characters. The mayors’ disenchantment with Dodge City – and all who live there – allows for some wonderful dialogue exchanges. Blood Duel is a well-plotted and beautifully paced book that is virtually impossible to put down as everyone is drawn to Coffin Varnish for the final violent showdown. 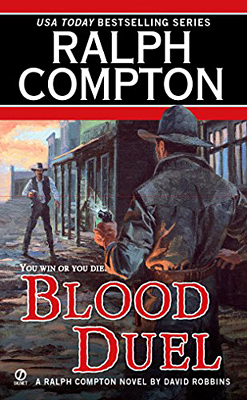 Blood Duel is a book that I believe should be enjoyed by all fans of western fiction. THREE CROSS - Shawn Starbuck had covered thousands of rugged miles through the wild Southwest, in search of his lost brother Ben. Now at last, he had a real clue. The end seemed almost in sight... Then Starbuck met up with Jim Kelso, a man who desperately needed his help. Kelso’s ranch, Three Cross, was besieged by ruthless marauders who would stop at nothing until the ranch was theirs. What were they after? What was the priceless secret of Three Cross? Starbuck swore to find out, though it might mean losing the trail to Ben—and his own neck. Having enjoyed the first two books in the Shawn Starbuck series so much, I just had to read these as soon as Piccadilly Publishing made them available as ebooks. Three Cross was originally published in 1970 and Deputy of Violence in 1971. I didn’t intend to read them one after the other but just couldn’t help myself as Ray Hogan once again captured my imagination with his superb storytelling. Both tales move forward at a rapid pace, contain lots of action, including fist fights which one would expect when you find out Starbuck is a trained boxer. They are both filled with excellent characterization and include plenty of twists and turns, many of which I didn’t see coming. Three Cross pulled me into the story with its mystery elements of why someone is out to kill Jim Kelso and what they hoped to gain from doing so. Then there is the question of how Starbuck will win over Kelso's daughter who has taken an instant dislike to him. My need to find out the answers to these questions and more kept me turning the pages and I read this story in one sitting. Deputy of Violence starts exceptionally well with an extremely gripping sequence telling of Starbuck’s ride into a seemingly deserted town. This scene filled with atmosphere that takes on a creepy tone when Starbuck meets the man running the hotel. 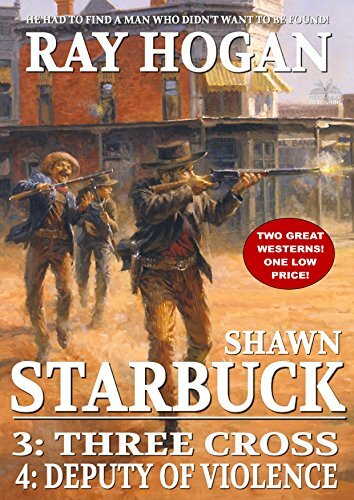 As well as battling a gang of outlaws single-handedly Starbuck will also have to deal with his feelings towards a young woman who wants him to take her away from the hidden valley where the town is located. Of the four Shawn Starbuck books I’ve read so far, this one is my favourite. Roll-on May, when Piccadilly Publishing will release the next two books in the series.